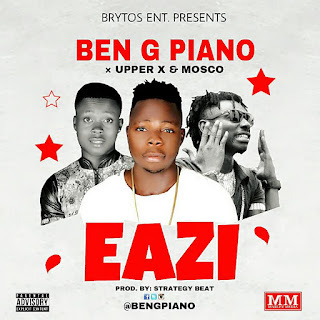 Fresh indigenous single titled EAZI from Brytos Entertainment by Ben G Piano featuring Calabar hottest rapper Upper X, and Uyo based singer Mosco. Ben G Piano was signed into Brytos Ent. in 2017 and is the front line act under the entertainment label. This new jam titled EAZI, produced by Strategy Beat came with so much fire. A dope tune with amazing vocal delivery from Ben G Piano & a perfect finishing job from the featured acts. Certainly all DJs will favourite this jam. Enjoy GOOD MUSIC!